It has become a regular occurrence now that i go to Sansar Atlas hopping on Saturdays. It’s basically a rip off of the Goony adventures we hold every last Friday of the month in Second life where my friends and i venture to new places and explore. It is interesting how my new friends in Sansar are beginning to blame all mischief on me, wether that’s due to my name, my avatar or my actions in VR i don’t know for sure. It could well be the sum of all three. Anyways, Sansar is a once a week thing currently. Partly due to me having to bootcamp into windows every time i want to go there, but there are other reasons. So i have made a list of five things i think could entice me to use Sansar more. For literally YEARS i’ve wanted an update to Second Life that would allow me to animate mesh objects with an animation. This year we finally get it in the form of Animesh, a feature once considered ‘something more suited for the NEW THING (Sansar)’. It’s interesting then that Animesh appears in Second Life before Sansar, which just goes to show that Sansar doesn’t get all the new features first. If the Lab ads the ability to animate mesh via custom skeletal animations or blend shapes in a way that is as simple as Unity3D then i can see myself choosing sansar over unity3D as a quick place to build and record VR Machinema while also building places that come alive. [UPDATE] So right after posting this blog i discovered the Lab has quietly added support for rigged animated objects. So everything i said above…. forget about it. 4. Make VR and Desktop more friendly towards each other. I spend all my Sansar time in VR mode with a headset on after getting past the initial social anxiety and i’ve noticed there are two plains of existence that habit the same space, The VR world and the Desktop world. So i can be talking to friends in Sansar on voice and as you get to know people you start to put voices to avatars. But you notice there are the quiet ones that dont talk and you ignore them not realising they are very vocal in text chat. You can peek into this world by opening the chat window and reading their secret conversations. The way the chat window works could do with a rethink maybe, since it just floats at a single point and disappears when ever i visit a new place. Perhaps add an ability to post ‘quick messages’ to reply in chat. I basically screaming for some kinda wrist based quick buttons for various actions in VR mode from dancing, sitting to Emoticons and sending quick messages via chat, preferably on a Nintendo Power Glove. 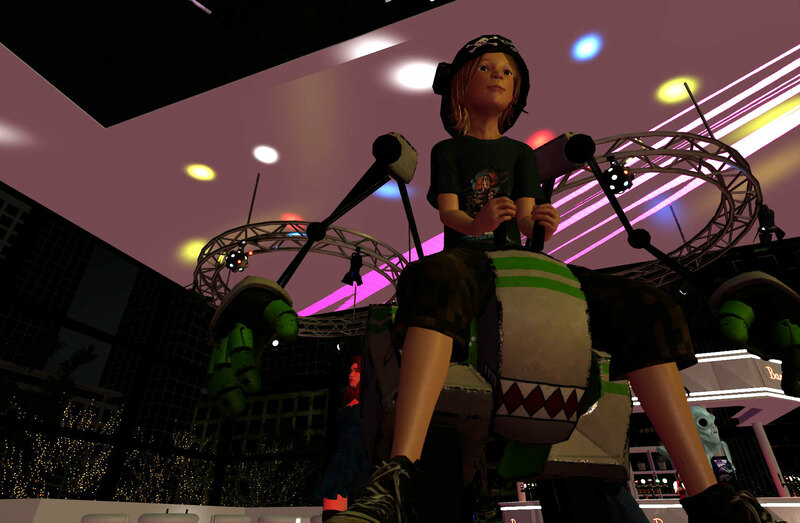 In Second Life i’m a kid persona, In Sansar I’m the same kid but on a robot because Sansar does not yet allow Custom Avatar Sizes. Places like VRChat and High Fidelity allow for any avatar of any size and any shape imaginable, but Sansar went a different route with more advanced avatars, with more advanced clothes system and more advanced facial animations which has led possibly to some limitations. Using marvellous designer people can create clothes that you can adjust and even flip over your avatar and there is a synergy to the Sansar avatar. Then there is me who just wants to break all that synergy. Did you see you can customize your #Sansar avatar in VR now? The Lab introduced ‘custom’ avatars to allow creators to import their own creations. With custom Avatars, the more you deviate from the original Sansar Avatar Skeleton the more things break so i’m guessing thats why there is a hight restriction until they can work out how to go forward. Is it a technical problem or a branding problem with regards to the differences between the Super high tech Sansar Avatar and Custom Creator Avatars. In any case, being able to get off that robot would be awesome, because i know a lot of friends who would then visit from Second Life. OMG this stupid 3D mouse has ruined everything by being the best way EVER to navigate 3D Space. The Conncexion3D Space Navigator is even better than actually moving around in VR. I use mine more to navigate Second Life, Blender, Substance Painter. All those fun gifs from my DJ set are taken using the SpaceNav. It is the peak of navigating 3D space on a desktop, so WHY the HELL does Sansar not support it at least for the editing mode? I would be experimenting faster, building faster, with more precision and i would be enjoying it. Alas, I still do not find Sansar all that appealing. It still seems lacking somehow. Even the much vaunted graphics do not seem all that great when compared to the best of what is going on in SecondLife. The VR aspects of it are wasted on me because within five minutes of donning a VR headset I’ll be violently emptying my stomach into the nearest trash container because of intense motion sickness. Nor do I find the graphics all that good in Sansar. I see things in SecondLife every day that rival or surpass what I see in Sansar. And then there are the delays… Why does it take so long to load a scene? It’s gotten better, yes, but it still takes minutes for a new region to load. And where are the people? The only time I’ve ever seen anyone in any of the regions I’ve visited over there has been when they were doing a special event. Frankly I find Sansar a bit cold, even soulless. Perhaps that will change with time. Great read. I checked out Sansar in July 2017 and I don’t have VR. Desktop mode was super limited back then so I didn’t invest my interest deeply into Sansar. I just recently came back to see how things are going (still without a VR setup) because something in the Feb. 6th update newsletter piqued my interest and I’ve since forgotten exactly what it was, haha, but I am SO GLAD it did!! I got to see your you-on-a-robot this last Saturday and I was absolutely floored by how awesome it is! And it was super inspiring to see what the default avatar rig can be sort of manipulated into without being allowed to transform the rig bones.